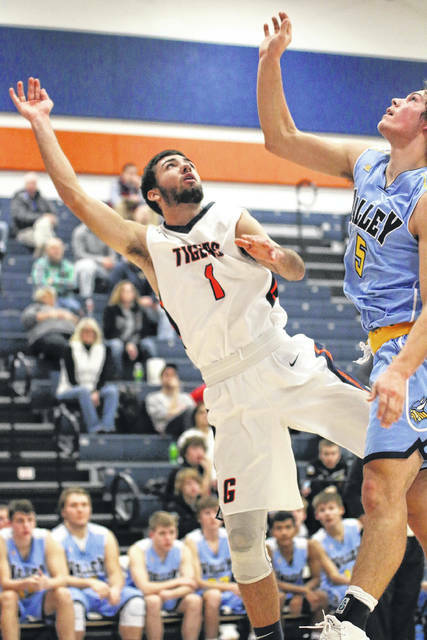 GALION — The Galion High School gymnasium was raucous on Thursday evening when the Tigers boys basketball team welcomed the visiting River Valley Vikings to town to compete in Mid-Ohio Athletic Conference action. After one quarter of play, the game appeared to take on a back and forth tone as the score sat at 18 points apiece. Throughout the remainder of the first half, that particular tone would continue and it would be the home town Tigers heading into the half up by a score of 38-32 over the Vikings. The big story of the first half and throughout the game was the play of sophomore Isaiah Alsip. After 16 minutes of play on Thursday, Alsip had already netted 26 points to lead all scorers. In the second half, Galion appeared poised to write a different story. When the buzzer sounded after the end of three quarters, the Tigers stretched their six-point lead to a 15-point lead and headed into the final frame up 65-50. The Tigers kept the pedal to the metal and would continue the offensive onslaught in the fourth, tacking on an additional 26 points to seal the game; 91-70. With the victory, Galion improves to an even .500 on the season and within the MOAC at 2-2 and 1-1, respectively. River Valley falls to 0-3 on the season and are 0-2 in the conference. Alsip would finish his scoring output at the free-throw line on Thursday, sinking two and bringing his point total for the evening to 41 points to lead all scorers. Alsip went 10/17 (59%) from the interior, 4/6 (67%) from the perimeter and 9/11 (82%) from the charity stripe on the evening while also recording a double-double by swiping 10 steals. He also grabbed four rebounds, dished out two assists and swatted a block. “Before the game, coach told me to come in and get my defensive game going and that that would open the offensive game,” said Alsip. “Obviously, it worked…shots were falling and I didn’t even realize that I had that many steals. It was a huge team win for us and great motivation moving forward,” wrapped Alsip. Four teammates would join Alsip in double figures against River Valley in the win. Zhamir Anderson, Gage Lackey, Jack McElligott and Colten Skaggs all finished with a dozen points for the game. Anderson went on to also grab eight rebounds, dish out two assists and record two blocks. Lackey, who found himself in foul trouble in the first half, went on to also finish with five rebounds while McElligott snagged six rebounds and one assist. Skaggs was 6/6 from the field on Thursday and missed a double-double by just one rebound but did net a steal, a block and an assist to round out his stat line. As a team, the Tigers shot 33/55 (60%) from inside the three-point line while going just 4/13 (31%) from deep. Galion converted on 13/17 (77%) of their free throws on the evening as well. The home squad finished up the win with 39 total rebounds, 15 steals, 10 assists, five blocks and 12 turnovers. 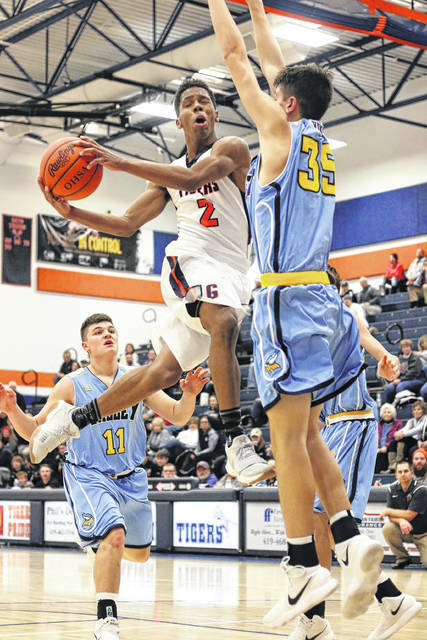 Other stats from Thursday for Galion were: Carter Keinath- 2 rebounds; Nate Eckert- 2 points, 1 steal, 1 assist; Colton Powell- 1 rebound, 3 steals, 2 assists and Tristan Williams- 4 rebounds, 1 assist, 1 block. Team stats for River Valley in the loss were: 22/45 (49%) from the interior, 4/9 (44%) from the perimeter, 14/28 (50%) from the free-throw line, 26 total rebounds and 22 turnovers. A pair of matchups against MOAC teams now awaits the Tigers. On Saturday, the Galion squad will head over to Marion to face the Harding Presidents (0-4, 0-2) and will be on the road against the Clear Fork Colts (3-1, 2-0) on Thursday, December 21. The Tigers Zhamir Anderson soars up high for the lay in against the Vikings Adam Hawk. Anderson was one of four players to finish with 12 points on Thursday in the 91-70 Galion victory. Sophomore Isaiah Alsip had himself a game Thursday against conference foe, the River Valley Vikings. Alsip finished with a double-double of 41 points and 10 steals and helped the Tigers to the 91-70 home win.